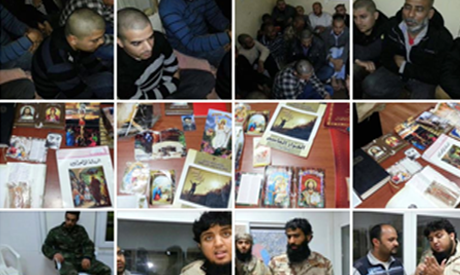 Photos published on Facebook of detained Copts in Libya accused of proselytisation. Activists in Libya on Thursday posted photographs on Facebook allegedly portraying Egyptian Coptic-Christians detained in Libya on charges of proselytising. The activists asserted that the images would also be sent to the United Nations, the Egyptian embassy in Libya, the Egyptian foreign affairs ministry, the Libyan Observatory for Human Rights and Human Rights Watch, in hopes that "action would be taken to secure their release." According to a source from Egypt's Coptic Church, a group of Salafist Muslims attacked a church in Benghazi this week and detained roughly 100 Egyptian Copts working in the country. The detained Copts had been tortured by their captors, who had also shaved their heads and used acid to burn off the crosses tattooed on their wrists, the source – who preferred anonymity – told Ahram Online. The source added: "The Coptic Church has sent an official request to the Egyptian Ministry of Foreign Affairs, which in response has begun negotiations with its Libyan counterpart to resolve the issue and release the detained Christians." On Thursday, Coptic Bishop Pachomios, archbishop of Beheira, Matrouh and Libya, told the media: "I am following up on the issue with church authorities in Cairo and the Egyptian foreign affairs ministry." Speaking from Ethiopia, Pachomios added: "This is a very serious incident, in which Egyptian citizens were arrested on the mere suspicion [of proselytising] and tortured while in detention." The bishop confirmed that the Egyptians in question had worked in Libya, adding that "it doesn't make sense that as many as 100 Egyptian Copts had decided to engage in proselytising activities in another country." Naguib Gabriel, head of the Cairo-based Egyptian Union for Human Rights, expressed his dismay over the reports. He, too, voiced doubt that the Egyptians in question had been proselytising in Libya, saying: "Even if this were proven to be the case, they should not have been detained because of it." Gabriel said he had called on Ali El-Ashry, Egypt's assistant foreign minister for consular affairs, to intervene in the crisis. He said he had also urged Arab League Secretary-General Nabil El-Arabi to use his authority as Arab League chief to resolve the problem and secure the captives' release. "If the Egyptian state continues in its inaction and fails to do its duty to secure the release of all Copts detained in Libya, I will call on the UN Human Rights Council to intervene and stop this farce," Gabriel said. The arrests are the latest in a series of recent incidents in Libya targeting Christians. In December, two Egyptian Christians were killed and two injured when suspected Islamic extremists threw a homemade bomb at a Coptic-Orthodox church in western Libya. 100 Coptic people for proselytizing??? They come together to pray! My gosh, what a terrible world we live in that freedom of religion is shut down, and leads to torture! Where is the Egyptian government to help her children?